The above guests were garlanded by Miss.K.Anshika and Mas. 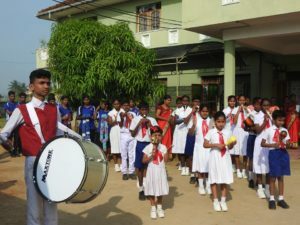 Ajay Dave Preschool student warmly welcomed with band music of the students of Vaalvosai School with the presentation of bouquet and handicrafts. 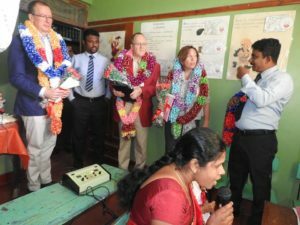 HE David McKinnon cong ratulated YMCA Batticaloa for its dedicated service rendered for the 17 years to the Deaf and Dumb students’’ educational process and improvement of their speaking capacity by the way of speech therapy. Such appreciation came from him after observing the above service rendered by YMCA. 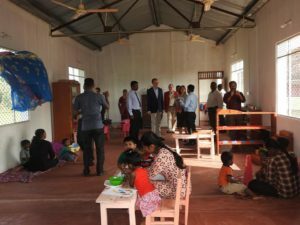 They had a discussion with the Mrs.C.A.Thayamathy Principal of Vaalvosai School and teachers of Vaalvosai School. 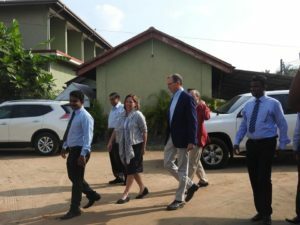 They visited the model pre-school which has been functioning for the last 06 months and observed the strategies the development of improving the senses of such students. The activity r eports of YMCA were tabled together with the presentation of activities by Mr. V.E. Dharshan, the president and Mr. J.Jegan Jeevaraj, the General Secretary. They met the former students of Vaalovosai School, who completed the education still up to grade 08.They had learnt at Vaalvosai School, Computer Graphics Designing Programme, in order to achieve their future prospects. The parents of the above student s also took part at this mee ting. Mr. V.E. 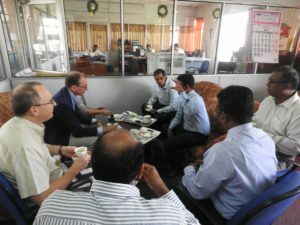 Dharshan gave an explanation to the former students and their parents about the importance of the Computer graphic, photo shooting and English learning its future benefits and advantages. Mas.J.Jathulan, a student at the above education programme presented a drawing to the guests.